Female Centaur--beautiful, bare-breasted; with long, flowing hair--the mythical half-human, half-equine creation of Greek mythology came into being as the offspring of the son of Apollo and Stilbe, the nymph daughter of the river god, Peneus. 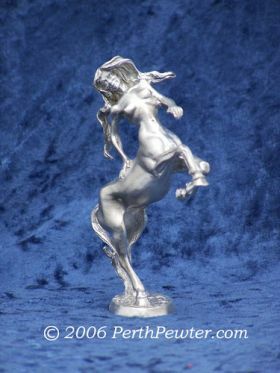 This beautifully detailed Ray Lamb rendition of the Female Centaur for Perth Pewter stands approximately 4 1/4 inches tall by 3 1/4 inches wide. 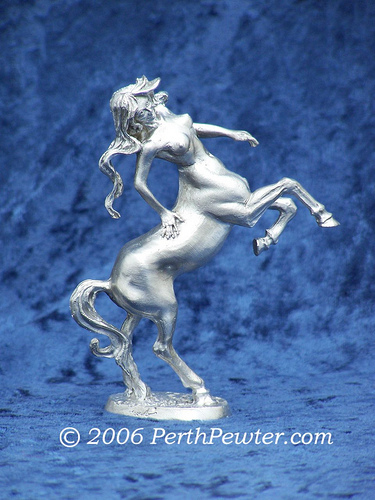 Collect all three Centaur sculptures: Male, Female, and Child.